(14 Aug., 2018) Yesterday was the first day at Brawijaya University and the Dean and Vice Dean of the Faculty of Cultural Studies (FCS), Prof. Ismatul Khasanah and her staff all welcomed us warmly to the university. The START program students and I received generous welcome and gifts that will help us to do our studies while we are here at Brawijaya. After the ceremony, Prof. Khasanah gave a lecture on the basics of Bahasa Indonesia. With the START program students and I, we learned basic pronunciation and how to read Bahasa Indonesia. (15 Aug., 2018) In the previous day Brawijaya professors gave us lectures on Bahasa Indonesian language and about international relations and cooperation with Japan. The lectures were very informative and I assisted the professors in helping the START program students to understand the contents of the lectures. 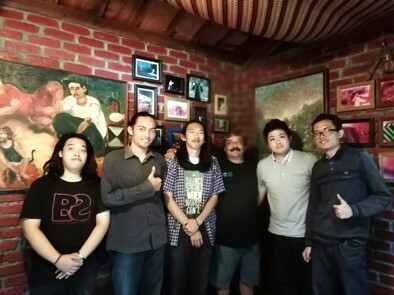 Didik Hartono Sensei taught us about Bahasa Indonesia and Nyoman Suluh Sensei taught the students about Urban planning and development in Malang. I assisted Nyoman Sensei with helping to clarify and explain some technical terms from his presentation. Later this week, I will be giving a presentation to the Brawijaya students about Global Citizenship on 8/16, where we will have a discussion and exchange between HU students and BU students about global issues and topics concerned with Global Citizenship Education. Until then thank you and we are learning so many valuable issues that affect Japan and Indonesia here at Brawijaya. In the past week, the Brawijaya students have asked me many questions about living in Japan as a foreigner and what studying at a Japanese university is like. We shared the similarities and differences about curriculum, the academic schedule, types of courses, daily living and weather in Hiroshima. They were very surprised to hear about the cold winters we have in Saijo, but were also happy to hear that HU has many students from Asia, from Indonesia and especially from Brawijaya University. On Thursday 8/16, I was asked to do a 90-minute, mixed lecture-discussion with 12 students from the Faculty of Cultural Studies (FCS) at Brawijaya University. We discussed the definition of Global Citizenship from the Indonesian and Japanese perspective and then we also discussed local, national and global issues in both of our countries. Issues included gender disparities, plastics and pollution in the environment, and economic poverty. After the lecture, the Brawijaya students really reflected on what they can do to help their country and also how to cooperate with Japanese students on environmental issues, such as air pollution and rubbish disposal issues in the environment. The lecture-discussion was a great success, and we used what we learned about global citizenship to better understand our homestay experience on 8/19-8/20. Thank you for your kind attention and interest. Terima Kasih Banyak (Thank you very much in Bahasa Indonesia Language). Today I am writing my latest and final update to my internship here in Indonesia with Brawijaya University. Last night, the Dean, Vice Dean, Dr. Ismatul Khasanah and other esteemed professors held a closing ceremony and farewell party for the HU students and I. 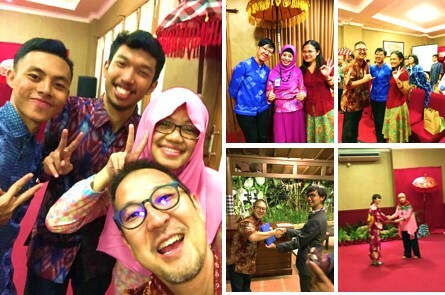 It was celebrated with a sharing of our past few weeks together, speeches by the professors and students, and also the students shared songs and dancing from both Japan and Indonesia. It was a very touching and wonderful closing ceremony by everyone involved. I wanted to personally thank Brawijaya University's professors for allowing me to intern and to learn so much about Indonesia. The amazing students and staff at Brawijaya were so generous with their time, wealth of knowledge, and many wonderful souvenirs from Indonesia. I am so grateful for everything that they have shared with me and the rest of the HU students. I learned so much about Indonesian culture, language, history and more about the impression of Japan's historical and growing relationship with Indonesia. It is my hope to share my amazing GiECBO experience with everyone in Japan and at Hiroshima University. Lastly, I owe a great deal of thanks and appreciation to the Hiroshima University staff at GiECBO, International Study Abroad Center, IDEC, and my inspirational professor who made my internship possible. Terima Kasih Banyak, どうもありがとうございました、and thank you so very much. Greetings from Tallahassee, Florida, USA. I arrived on August 18th (sat) safely and have took a tour around the city to be used a little bit. I met with Dr Lisa Liseno, my host in FSU on August 21st (Tue). The program I have applied for was mainly about attending the teaching assistant conference called PIE program. It was held on August 22nd and 23rd in FSU. It was very interesting and I have learned a lot. On August 24th (Fri), I attended a meeting with Pr Ella-Mae Daniel with all of her teaching assistants to discuss about how we are going to manage the classes for this fall semester. Since last Monday, internship in PUSKIM, Indonesia, has been started. Indonesia is a hot country though, Bandung which is the location of my host institution, is cooler than other cities. Without air conditioner, I can survive. 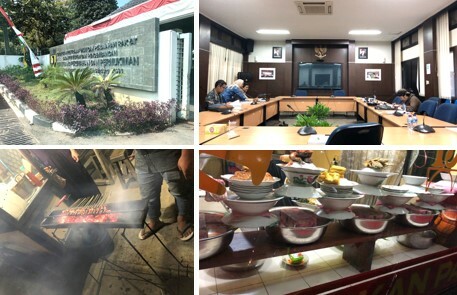 The first week, I greeted to people in PUSKIM, participated in the meeting, visited Bandung city to get the information about my research, and discussed about what I should do during internship with my supervisor in PUSKIM. Here I enjoyed Indonesian food as you can see my photo. Almost all Indonesian food is spicy. So right now I try to adapt. I hope this finds you well and I hope those who are in Japan are doing well since the typhoon has come. So, I am writing to share with you my second week in the Florida State University. I was visiting the Distance learning system at FSU and have learned about their mentors work to support learners and make learning better. Last week, the extracurricular activities in the FSU was holding a welcome event to let new students know more about the activities each club is doing and let them be a member of each group. It was very interesting and I knew from that that there was a Japanese language learners association. So thankful for the opportunity to be here. Best regards everyone and wishing you a good day where you are. Greetings from India, New Delhi.On Sep 7th, I arrived at India safely. Before coming to India, I stayed in Philippines to improve my English skills for 3 weeks. In Philippines, I took English class form 9 am to 4:30 every day. There were many homework, so it was very hard. We did science experiment in the elementary school for our class. It became very good experience for me. And teaches are also cheerful and kind. In the weekend, we went to Apo Island, near Cebu Island, to swim with sea turtles. There are many turtles in the beautiful sea. I also want to enjoy Indian Internship life! Today, I come back to Delhi from Jodhpur to meet Japanese student. Jodhpur is famous as blue city. And it is one of the model city of Japanese comic, “ONE PIECE”. I attach the picture of Clock Tower in Jodhpur and when you read vol. 18 ~ 23 of “ONE PIECE”, then you can see this clock tower in the comic. In Jodhpur, I visited a NGO which provide education for poor children.Time was limited so I can’t research deeply. I want to try again after finishing Study Tour for university student. Last Friday, I went to the site of “Kampung vertical housing”. There is a slum area in Bandung, Indonesia. Now, Indonesia government try to diminish all slum areas in Indonesia. This project is that residences in slum move to the government owned vertical house, then, the place which is used to be slum has been changed to more clean and comfortable place, and finally people who used to settle will come back to the place again. I saw the middle process, that is kampung vertical housing which is owned by government. It was nice place though, I found one issue causing anxiety. There is a hole at the stair. So I guess it is dangerous for children. Although it may be difficult to recognize for you, I attached pictures. You may confirm with the picture. Anyway, I enjoyed talking with resident and enjoyed the environment. This weekend, I am supposed to visit another slum area. This is my first weekly report.I arrived Bandung on 14th's evening safety. And I started working in Puskim from last Monday. In this week, we prepared the our office firstly. The institute gave us the small room and we cleaned up the room to use the room comfortably for 2 month. And then, we did the calibration for measurement equipment. The construction of our experimental house is now on going. The field measurement will be conducted from early of October. During September, we will do the preparation for measurement and manage the construction. We grow plants for experiment at same time. Current situation of plants is shown in the attached picture. On this Friday, we did the meeting with ITB lab for the design of another experimental house that will be used for our research in future. I am in Bandung, Indonesia. In this week, I met to Prof. Yuri. He is manager of Kampong term. We discussed my research and going program in PUSKIM. I understood what they do. On this Thursday, I went to two kampong areas. I got an introduction from UPI university students who conduct joint research with us. We discussed What they are trying in Kampong and observed their daily life. In one kampong area, efforts of people took an award. I thought the kampong is very clean and they follow some rules. Next week, I will go to some old apartment to observe daily life of residents. So, I will decide research area and observe. Now, I lead some university student who join in Study Tour. We visit in some NGOs for observing NGO’s activities. There are many activity in NGO, for example life skill education, vocational training, basic education and so on. And we think about which education is most important for street children every day. 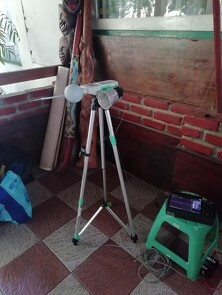 Last Thursday, we started to measure the sureface temperature and the amount of transpiration of plants that will be used for experiment. We will use the 2 types of plant, annual plant and perennial plant. The amount of transpiration is important parameter. 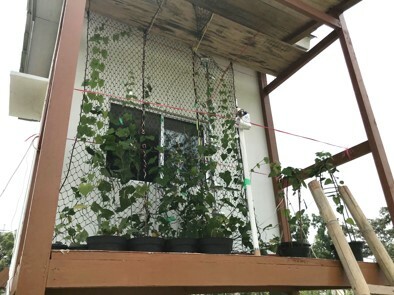 We will evaluate the cooling effect by transpiration of the green wall by difference of the amount of transpiration. I have been to Surakarta in this week to visit Kampong area and obsearve a project about slam clearance supported by Puskim. Puskim and government are trying to move to new residence from slam. Now they are constructing new residence. Residents also join this constructing. I also obsearve the slam 's community. They gathered some shaded space to eat something, chat and rest. A lot of people work in the area. So, they have a good relation. Now, I am summarizing my understandings and preparing for the final presentation in front of my supervisors. My internship will be finished on coming Friday. At first glance, 1 and half month is so long period though, it seems time flies actually. This is my 3rd weekly report. Last Thursday, I went to ITB to do the meeting about the experimental house that will be used in my research in future. I take charge of the insulation part. The construction of this　experimental house will be started soon. Now, we are determining the detail design with ITB and YKKAP team. Next Monday, the meeting will be held again. After the meeting, the special class was performed by Andhang san, who graduated IDEC Ph.D and work at YKKAP now. I joined it. He talked about urban heat island in the class. His class was very interesting and I learned a lot. Attached photo were taken at the meeting and class. This is my 3rd weekly report. In this week, I visited some Kampong areas and had a meeting with prof. Usep from UPI (I ndinesia University of Education) and UPI students to decided research area. I found some activities such as waste management, traditional music, Indonesian kung fu and so on. They have different activities each Kampongs. Actually, we haven't decided research site yet. In next week, We will decide to research area and collect some data. Last night, I arrived Saijo from Indonesia. Through this internship, I have learned a lot of things. For instance, I understood what is processing in Bandung, how a project is operated. As well, substantially I knew another things such as habit of prayer, humanity of Indonesian people, Indonesian language. My duration was 44 days, it seems long period. But it was very short time for me. This experience encouraged further interest of international cooperation. Thank you very much for giving me such a precious opportunity. This is my 4th weekly report. In this week, we have decided to two research sites. Both of them are Kampongs and have a good community. In this Thursday, I had a meeting with UPI university students who help our survey. I explained it. Next week, I will start our survey in Ledeng. In this week, the construction of experimental house proceeded smoothly. The roof and the insulation were installed, and the external wall was painted by high refrective paint. The construction will be completed and we start a measuremet on next Monday. Last Monday, the meeting about real scale apartment experimental house was held at puskim and I joined it. We continued discussing the detail design as last week. Next week, we will start measuremet. This is my 5th weekly report. I have conducted research in Kampong Ledeng with UPI students. We did questionnaire survey last week. In addition, we have obsearved behavior of residents by using interval recorders. In Friday night, they had a charity event in this area about tunami in Indonesia. A lot of people came to this area to do disscussion. In this week, the construction was finished somehow. The construction was scheduled to be completed on Monday, but it was completed on Thursday actually. And then we started setting of measurement equipment. the setting will be finished by today. Next week, We will conduct the fundamental measurement and analyse the measurement data. And then, the experimental measurement will be conducted. This is my 7th weekly report. I have finished survey in 1st research area. I could find some activities in community hall and semi-outdoor space that placed in front of building. I think residents make a good relationship in this area. I am glad to conduct some survey in Kampong Ledeng. They are very kindly for me. In this week, I move to next research area. I prepare to start measurement. I would like to send 7th weekly report. We started the experimental measurement from last week. First case is conduced to compare difference between green wall and wooden louver. The surface area of louver was made a same as green wall by removing slat of louver. And, the horizontal projection area was made also a same as green wall by operating slat angle. In this week, we will analyse measurement data and conduct next cases. This is my 9th weekly report. I this week, I obsearved behavior of residents in the morning, lunch time and night time. I found that they live in semi-outdoor spaces. Semi-outdoor spaces mean shaded spaces in front of residence and huts. They rest, eat and chat in the spaces. It seemed so happy. Thay had a festival in this Friday. To put it simply, the festival was to turn off lights in the evening, adults threaten children. I introduced it as a picture. This is 10th weekly report. I have finished measurement in Kampong Ledeng in this week. Residents have community organization, they call it CCL. They have a lot of activities like theater, music, dance, literature and some events. So, they have a good relationship. I will be back to Japan at 29 Nov. I will be looking forward to meet you. I would like to send 10th weekly report. Last week, we finished all measurement and removed measurement equipment. I will analyse measurement data after going back to Japan and report results to you in post internship presentation. Today, all member staying in Puskim will leave to Japan. I had a good experience through this internship. I'm looking forward to report my experience to you. See you in Japan.